Dr. Angel joined the Department of Animal and Avian Sciences at as an Assistant Professor in 1998. She received her BS (Animal Science), MS (Animal Nutrition) and PhD (Poultry Nutrition) degrees from Iowa State University. Prior to joining the University of Maryland, she was Nutrition Research Manager at Purina Mills. Dr. Angel’s current research focuses on improving nutrient retention and reducing nutrient waste in broilers and laying hens through the use of feed additives, feed nutrient changes, and proper selection of ingredients. Dr Angel has a large body of published work in referenced journals, is an Associate Editor for the Metabolism and Nutrition Section of Poultry Science and has published five book chapters. She has also presented over 80 abstracts and conference proceeding. 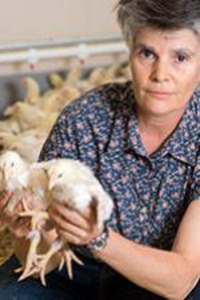 She has also won several awards including the Delmara Poultry Industry Medal of Achievement Award, the National Chicken Council 2006 Broiler Research Award, the American Feed Association Award and the American Feed Industry 2007 Poultry Nutrition Research Award.